i like pie. and all foods, really. i blog mostly about food, but sometimes about other things too. i'm pretty snarky. As much as I love pie, I don’t seem to make a lot of it. I mostly stick to things like tarts and cobblers and crumbles, things with lots of fruit in them. Things that you can screw up and still rescue. Cakes though – cakes scare me. You have to be precise and whip things and cut things and gah! Scary! I’m not a precise measurer, and you have to measure precisely with cakes. On Saturday, we went to a wine party and everyone was asked to bring a dessert. So I looked through our recent food magazines (Bon Appetit and Food & Wine) for an easy dessert. I found this one, which wasn’t too complicated. First, you make the cake. Pretty simple. Then, you make the orange confit, which is decorative. Honestly, I think the cake is fine without the confit. I didn’t cook this as long as it said to (only 20 minutes) because the syrup began to thicken. The confit was crusted with syrup and I had to rinse it off. So, you can do without it, I say. This is the water and sugar getting angry before it simmered down and became thick syrup. Here’s the cake baking. It rose dramatically and then fell in the center. Here’s the finished product. My handheld mixer burned out, so I whipped the cream by hand. Didn’t take long. I smoothed out the dip in the center with the magic of cream. 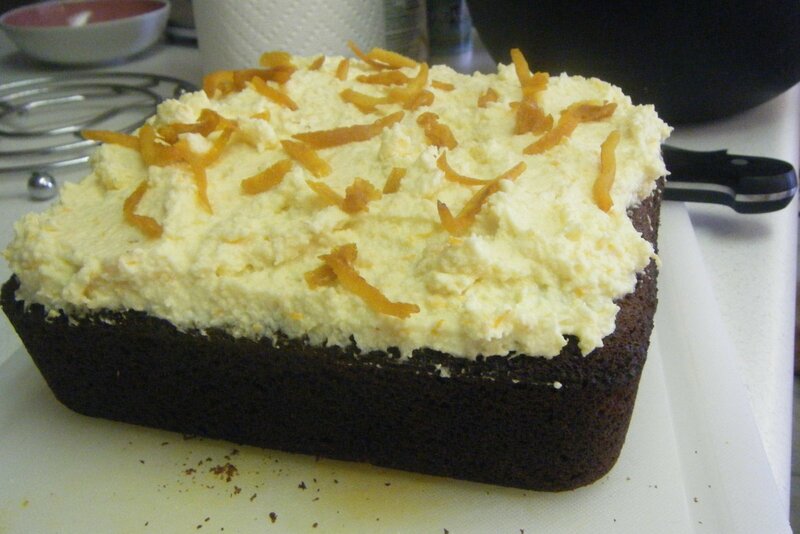 I also added about three times as much orange zest to the cream because it tasted like plain cream to me. I wanted it to be zestier. All in all, pretty good. The cake was a little dry, even though I took it out about 10 minutes before. The icing melted a little on the drive over to the party, but this is San Antonio, where everything is crazy hot. Can’t be helped. Make the Cake: Preheat the oven to 350°. Spray a 9-inch square baking pan with vegetable cooking spray. In a large bowl, combine the flour with the ground ginger, cinnamon, baking soda and salt. In a medium bowl, whisk the canola oil with the brown sugar, molasses, honey, eggs and lemon zest until smooth. Whisk the wet ingredients into the dry ingredients until combined. Whisk in the boiling water. Scrape the batter into the prepared pan and bake for about 1 hour and 10 minutes, until a cake tester inserted in the center of the cake comes out clean. 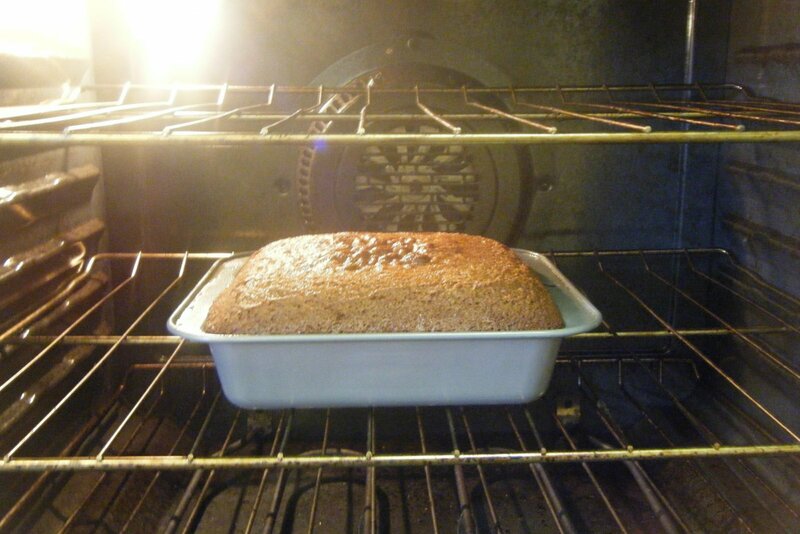 Set the pan on a rack and let the cake cool completely, about 2 hours. 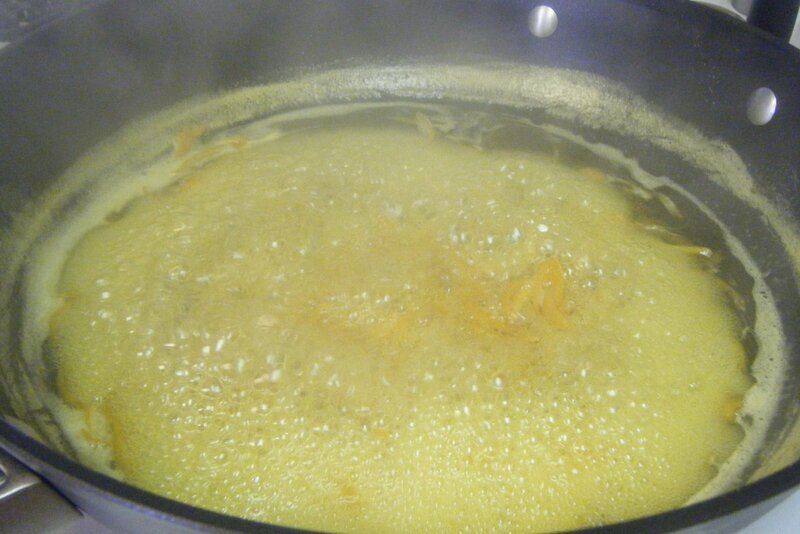 Meanwhile, Make the Orange Confit: In a medium saucepan, combine the strips of orange zest with the water and sugar. Bring to a boil and cook over high heat until syrupy and the orange zest is soft, about 30 minutes. Using a slotted spoon, transfer the orange confit to a plate; discard the syrup. Make the Mascarpone Cream: In a large bowl, using an electric mixer at medium speed, beat the mascarpone with the cream, orange zest, confectioners’ sugar and salt until soft peaks form. Cut the molasses-gingerbread cake into squares and transfer to plates. Dollop the mascarpone cream on top, garnish with the orange confit and serve. I like pie. And food. This blog is about my adventures in cooking, baking, eating, and finding new restaurants in San Antonio. I am kind of snarky. But I think you can handle that. Become of fan of the blog on Facebook!